I am not sure why the renamed this book written in 1995 but only finally being translated into English in 2013! 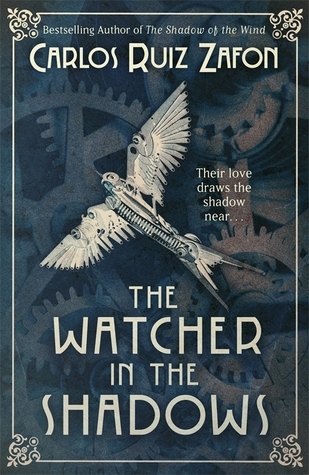 The Watcher In The Shadows (Mist, #3) ), in my opinion, this is the best of the three. They can be read separately and out of sequence. Bookendend by a letter from Ismael to Irene, and a letter from Irene to Ismael, the story is set 10 years before the letters in 1937 when they meet on the Normandy coast where the widow Simone Sauvelle has brought her two children Irene and younger brother Dorian, to take up a post of housekeep to the mysterious recluse, the toymaker Lazarus Jann. The magic of that youthful summer is captured as the two youngsters explore the world around them, discovering each other and uncovering the mystery of Alma Matisse in a mysterious diary. Their innocence is shattered first by the death of Ismael’s sister and then by strange happening at Jann’s house Cravenmoore, the surrounding woods and Seaview, the Sauvelle home in its grounds. Zafón builds the plot and tension very well to its ominous, atmospheric and highly visual climax where all the story elements come together to explain the dreadful deeds, the source of the mysterious shadow and how it links the story told in the diary to their own. It is ripe for making into a movie with the toys and the automatons which inhabit the toymakers world, the beautiful sail boat trips across the bay, and of course the evil shadow’s wanderings and destruction. As far as I know none of Zafón’s books have yet been filmed. Such as shame. For anyone who has read his The Shadow of the Wind (The Cemetery of Forgotten Books #1) , The Angel’s Game (The Cemetery of Forgotten Books #2) or The Prisoner of Heaven (The Cemetery of Forgotten Books #3) but has missed out on his others, I highly recommend this one. All translated to English by Lucia Graves. ashramblings verdict 5* I can’t but give this book 5 stars as it is a gripping tale, beautifully written and well told.